To create a new finals series, follow the steps given below. 3. Select the New Finals Series option from the New drop down list. The New Finals Series dialog will be displayed. 4. Specify whether you wish to create basic or advanced fixture by selecting the appropriate option. The available options are Basic Fixture and Advanced Fixture. Note: Advanced fixturing utilises the Court Availability tool to determine what competitions should be played on what courts. 5. Select the format for new finals series from the Select Format drop down list. There are different templates available for the series. The available templates are Finals 1 to 4 & 5 to 8, Final 4 Knockout, Final 4, Final 5, Final 6 Two Groups, Final 8, Final 8 Two Groups, Final 4 Knockout-Bronze Playoff, Finals 1 to 4 & 5 to 8 – Bronze Playoff, Finals 1 to 7, Final 6 and Top 2 Teams. 6. Select the starting date of the series from the Start Date calendar or check the Begin Immediately After Season Fixture option. 7. Specify whether you wish to skip the public holidays by checking or un-checking the Skip Public Holidays option. 8. Specify whether you wish to skip the school holidays by checking or un-checking the Skip School Holidays option. 9. Select the earliest match starting time from the Earliest Match Start Time clock. 10. Select the latest match ending time from the Latest Match End Time clock. 11. Specify whether the courts are assigned to the sports or not by checking the Courts option. 12. 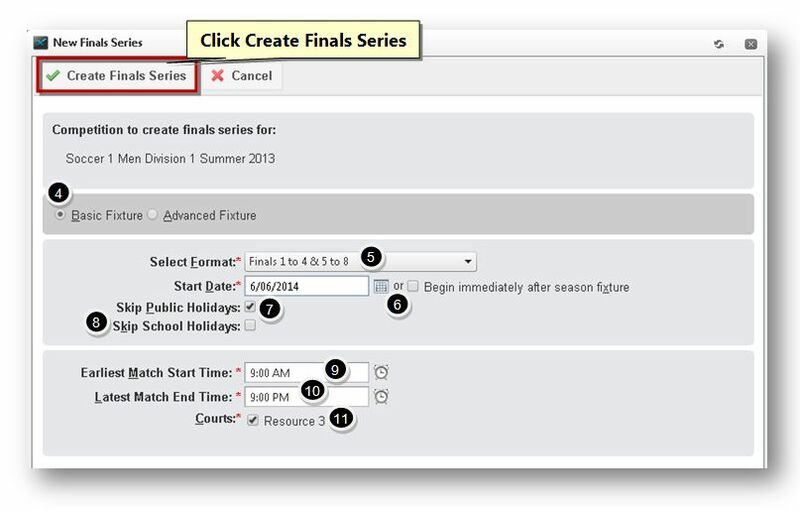 Click the Create Finals Series button. The new finals series fixture will be created.